For free motion quilting, I believe that practice does indeed make perfect – or at least practice makes you a lot better. Classes and books may point you in the right direction, but without practice on your part, you will never quilt as well as you want to. When I was a new machine quilter I practiced on quilts that I gave away. This allowed me not to stress out over mistakes. Don’t machine quilt on quilts that you care deeply about until you can trust yourself not to ruin them. Get a sewing machine that will do what you need it to do. Men have always known that if there is a tool you need for a particular job, you get the tool. You need a good sewing machine (we are Bernina girls). And you need the table that it sits in. I use cotton thread when I machine quilt. I’m a big believer is using the same fiber throughout the quilt and I don’t like (or trust) polyester thread. When I want the quilting thread to stand out on the quilt I use Superior’s King Tut or Mettler’s 50-weight silk-finish thread. When I want the threadwork to be more subtle, I use Superior’s 50-weight Masterpiece, Aurifil’s 50-weight cotton (which we have on sale until it’s gone), Mettler’s 60-weight cotton machine embroidery thread, or DMC’s 50-weight thread. This quilt has Fairfield’s Bamboo batting. I like it a lot! It has some cotton and bamboo is a “greener” plant fiber so I am happy to use it. If I wasn’t using that, I’d use a 100% cotton batting – Hobbs and Quilter’s Dream both have good batts. Here’s a tip that you won’t enjoy hearing, but it will help. 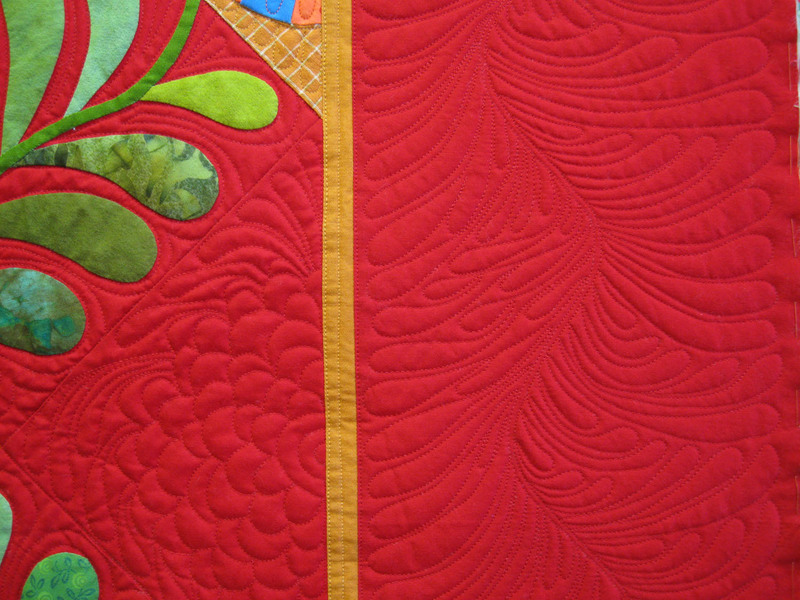 If you make a mistake in your free motion quilting, stop and fix it right then. What usually happens to me is that I’ll stitch up onto my applique when I wasn’t supposed to. Rather than hope that no one will ever see this mistake (because it will be the first thing that people see) I stop, cut my thread, bury the tails, and begin again. I don’t like doing it, but I do it. Every time. Eventually I slow down and am more careful. And here’s another tip that you may not want to hear, but I feel compelled to share with you: Strengthen your upper body! I always bring this up in class because I found out how important it is. I have osteopenia (not quite oseoporosis) and my doctor told me that I had better do weight-bearing exercises or I would be a bent-over little old lady some day. I walk 3 miles a day, 5 days a week; lift weights 3 times a week (for 1/2 an hour); and go to a 1-hour pilates class 2 times a week. I am not superwoman but I can really tell a difference! My back hurts less often, my posture is better, and I have more control when I machine quilt. Walking alone did not do this – it’s the weights and pilates. I used to be afraid to go to the gym. I was sure that I would stick out and be embarassed by my out-of-shape body. That has never happened. Most of the other folks at the gym are normal people with the same issues I have and they don’t care if I’m wearing my mis-matched gym clothes. If you are not exercising, now is as good a time as any to start. If you have never lifted weights, take advantage of the trainer at the gym so that you exercise correctly. If you are going to work out at home, consult your doctor first. You can hurt yourself if you lift with bad form. I started with really light weights. Feel free to ask more questions in the comment section and I’ll answer them as I can.